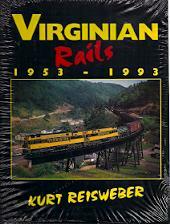 This is a look at the Virginian Ry from 1953 to 1993. Includes a look at operations under the Virginian, N&W and Norfolk Southern Railways, the Sewells Point District, Jarratt District, Altavista District, Roanoke Terminal, Whitethorne District, Steam, Diesel & Electric Locos, Princeton-Deepwater District, branchlines and more. Many photos, all color.